I like chicken and rice dishes, but many of them are the same basic recipe. I like them, but they were getting a bit boring for me. I wanted something with a little more flavor and kick. I wanted something different. I thought something with a spicy Mexican type flavor would be good. I wanted something we could eat just as a chicken and rice type dish, but I also wanted it to be a something I could serve with tortillas and beans if I wanted too. What I came up with works for both. This has great flavor. It was a bit spicy for several in my family, so they added a little sour cream to theirs. My husband thought it could be a little spicier. So, if you like food spicy, add a little more chipotle chili to it. This dish is a pretty frugal meal. You can easily make this stretch into two meals. 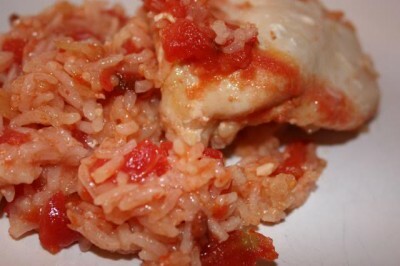 Make extra and serve it the first night as chicken and rice, add a salad or vegetable and you have a meal. Then the second night, use the leftovers served with beans and tortillas, lettuce, cheese, etc. I plan on using this as two meals the next time I make it. Cook onion in oil until tender. Add garlic, cumin, chipotle pepper, and cook for 1-2 minutes. You are just releasing some of the flavor here, not really cooking it. Add tomatoes, water, and rice. Pour into a 9×13 or equivalent pan. 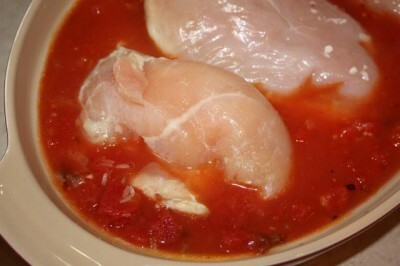 Lay chicken breasts on top of tomato, rice mixture. Cover with foil and bake at 350 for 45-50 minutes. Remove foil and cook 5-10 minutes more or until rice is done. The cooking time may vary on the depending on the size of chicken pieces that you use. This takes about 1 hour for me. For more recipes and ideas see Frugal Fridays, Grocery Cart Challenge, and Friday Food. That looks really good. I love chicken and rice and I would imagine this would be really good as a burrito filling. That looks really good. I love all the flavours. It definitely would be a hit around here. Anything that requires 3 cloves of garlic is a winner in my book! Thanks for linking up at Momtrends and helping to inspire other moms in the kitchen. I agree with you about the same ol’ chicken and rice. I am always out searching for new ones myself. This fits the bill!!!!!! Lynn…I just bought a hand painted serving bowl from Mexico, now I know what to serve in it! That does sound like a nice variation on a chicken & rice dish. Looks great!! I just stumbled across your site today while looking for recipes to use up the rest of a can of chipotle peppers in adobo sauce and I am EXTREMELY happy that I did! There’s so much useful information here I don’t even know where to begin:) We love the peppers but I’ve never really been sure what to do with the rest of the can. We like spicy food but these are intensely flavored and 1-2 is plenty in one recipe. Your version of chicken and rice sounds fab and right up our alley! I can’t wait to try it:) We’re having smoky BBQ Beef sandwiches tonight. It’s a really easy recipe which I’ll post if you don’t mind. I have the perfect solution for the extra chipotle peppers. I puree mine with either a small blender container or I use my stick blender. I put the “paste” in a small jar with a tight fitting cover. So I conveniently named this “chipotle paste”. Now I always keep a jar of this in my frig. It’s wonderful added to broth for soup, beat into eggs & veggies for an omelet, etc. I find many uses for it. Just keep in mind that a small amount, like a teaspoon, goes a long way. If you want a “more smoky” taste in your food but not added spice, add liquid smoke. It comes in hickory or mesquite. That is a great idea and would add a lot of flavor to so many things. Thanks for sharing.